Are you looking for a special dessert for your valentine? 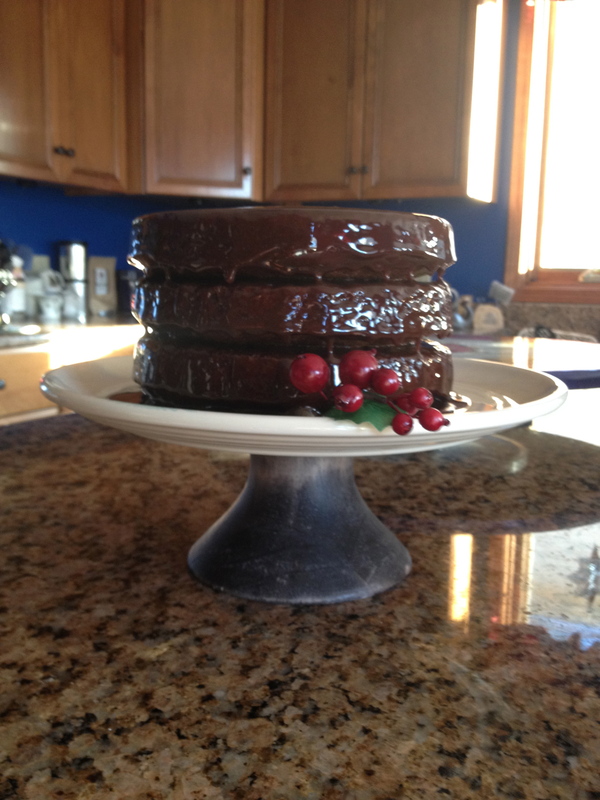 Let me suggest a treat I made this Christmas, the Rooibos Chocloate Layer Cake. It looked fantastic and tasted wonderful. 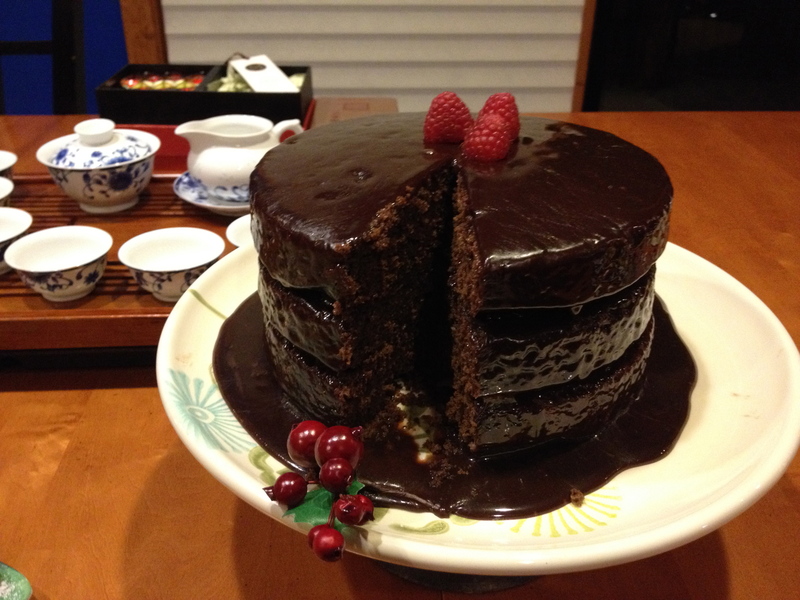 I must admit it had been awhile since I had made a chocolate cake from scratch and the thought of using rooibos, a nutrient rich tisane, was appealing. The rooibos added a “mild nutty” presence to the dessert. Almond Rooibos would also been excellent. Here is the recipe from our website along with a bit of my personal discoveries during the experience. ~ Pre-heat the oven to 350°F. ~ Steep 1 TBS Rooibos (I used chocolate caramel safari) in a cup with infuser, @ 208ºF (just under boiling) water for at least 15 minutes, until the tea is quite strong. This will be used in the cake batter. In another infuser steep 1 TBS Rooibos for the icing again at least for 15 minutes. Then remove the infuser and set aside until later. ~ In a large bowl, mix together the cocoa powder, vanilla extract and vegetable oil until smooth. ~ In a separate bowl, beat the egg yolks and sugar until they are thick and creamy. ~ Add the egg-and-sugar mixture to the cocoa mixture, and mix well. Add the strong tea (for the cake) to this batter and stir. ~Sift together the flour, baking powder and salt, add it to the batter & beat well. I did not sift the flour though, and the texture of the cake was still fantastic! ~Whip the egg whites until they form soft peaks, and fold them into the batter. This was fun and definitely gave the cake a lighter fluffier texture. ~Pour the batter into two round, 9-inch cake tins. I actually used three round 8 inch tins because I like the height of a 3 layer cake, as well as a little extra frosting. ~Bake 30 minutes, or until a toothpick inserted in the center of the cakes comes out clean. Again since I had 3 tins it took about 25 minutes. ~While the cake is baking, prepare the icing. In a small saucepan, heat together the sugar and butter until the sugar has dissolved. ~In a small bowl, mix together the cocoa powder and corn starch with a bit of the strong tea you have set aside and stir until it makes a paste. Add the remainder of the tea and stir well. ~Pour the cocoa-tea mixture into the saucepan and stir. Heat the icing until it thickens. The thickness is always hard to describe, ” thick honey-like” thickness is how I would describe the thickness. ~Stir in the vanilla extract, and bring the icing to a boil, stirring constantly. Remove the pan from the heat, and let the icing cool. ~Place the icing in the fridge to cool completely. Before serving, mix the caramel or dulce con leche into the icing. I used only 1/2 can of caramel which added plenty extra sweetness. ~ Remove the cakes from the oven and let them cool for a few minutes. 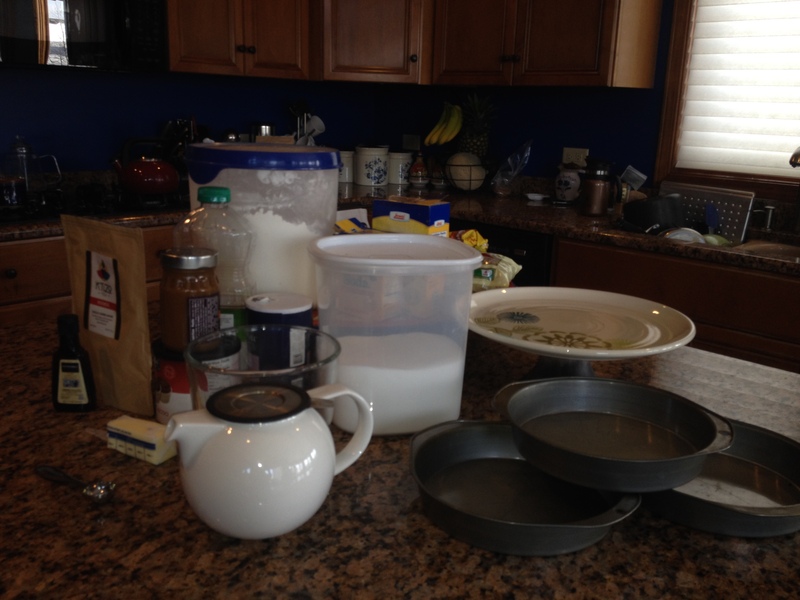 Then, remove the cakes from their tins and cool them completely on a wire rack. ~Divide your icing between your cake layers and the top of the cake. The icing is quite soft, so some will drip down the sides. I found the dripping distinctive creating an artistic look. ~Decorate with cherries, chocolate curls or fresh mint leaves, or berries. Enjoy! We did and we felt the rooibos flavor came through, something I look for when baking or cooking with teas or tisanes.